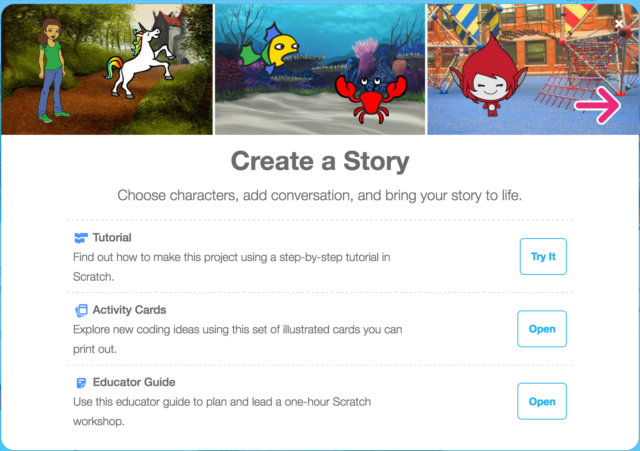 » New ways to get started with Scratch! 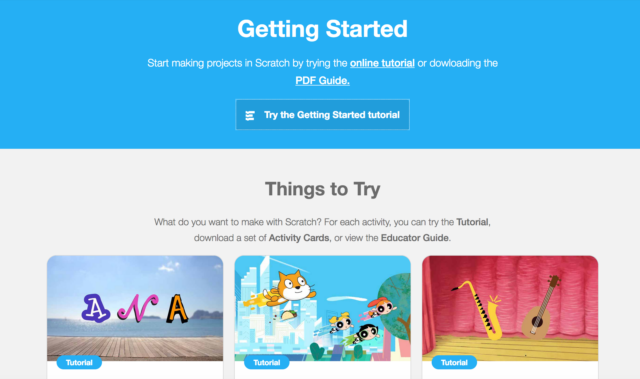 New ways to get started with Scratch! We are always looking for ways to make Scratch easier to get started with. Today we’re excited to announce that we’ve added lots of new resources to a new section called Tips! . On the new Tips page, you will find interactive tutorials that can help you start making a variety of projects. There are also printable Activity Cards with detailed instructions on how to build any of the projects you are interested in. In addition to the inclusion of the new Tips page, the site navigation menu has also been updated. We replaced the “Help” button with a “Tips” button, which will lead you to the new Tips page mentioned above. We believe this will help newcomers discover and use our new Scratch activities. We have also removed the “Discuss” button from the navigation menu. We made this decision based on usage (how often it was clicked) and to give emphasis to the other menu options like “Create” and “Explore.” You can still access the Discussion Forums by clicking the link in the footer at the bottom of every page or by going to https://scratch.mit.edu/discuss/. These changes were made to help highlight project creation and get new users started on becoming full fledged Scratchers! Where is “Discuss” in the footer? Can you make the search bar smaller to make room for discuss? This decision was also made in part because the navigation menu is translated to many other languages, and in some of those languages there was just too much text to fit in the space. The search bar is flexible in size based on the language you are in. While it may appear extra large in English, this is not always the case. For example, change your language to Deutsch and see what happens. And this is with one item removed from the nav bar - imagine what it was like when there were five items in the nav bar before. Oh, I guess I was first or something. When this was put in, the Edible Scratch language stopped working on every page that wasn't the main page or the Tips page. THIS IS MY SIGNATURE. THIS MEANS IT IS AN AUTOMATIC MESSAGE THAT APPEARS AT THE BOTTOM OF ALL MY POSTS. Hi! I'm FancyFoxy! I create animations and games that were never, EVER meant to be taken seriously. FancyFoxy Heroes and #Thanksgiving are some of my latest projects, check them out! I can't find the “Discuss” option inside of the footer. Is that meant to happen? nooooooooooooooo! I want the discuss button in the normal place. no one new will go to the discussions page! try to place it in the profile drop down menu. Why would it be in the profile dropdown menu? It doesn't have much to do with your profile. I was just suggesting something. you need to have it somewhere visible. It is visible at the bottom of all Scratch pages. but it's not that visible. at all. Ah, OK. That makes mores sense. Nooooooooooo. The discuss option was already the most obscure option. I didn't even know it existed until I saw a link in a curated project. And I didn't even know the full extent of what discuss was for until this year. Making it even more obscure is a bad idea. New Scratchers who need help with scripts that aren't in tips or have a question about Scratch aren't going to know where to look now. New Scratchers who don't know about the forums may try to post comments that were their function on featured projects creating more spam. I don't even see where the discuss is in the footer. Instead of pushing the forums aside you should promote them. Did you even do a poll to see if most people who didn't click the button didn't know they exists instead of them being not interested in them. I also don't see how this promotes the other options. All this appears to do is make the search bar bigger, and I used it even more rarely then the forums. I feel that removing the discuss button is a step back for Scratch, and I am hoping right now that this isn't the beginning of a road of step backs like another site I used to be on because I like to program in Scratch and I hope that updates won't one day take the joy out of it. That site was Roblox. I would greatly appreciate if you were to check of this game I spent months that includes plot and bosses here https://scratch.mit.edu/projects/97452006/ ………………………………………Want a detailed review or idea? I'm a major fan of Pokemon, Undertale and the Pija and Toast series. I am doing a shiny scramble of pokemon Pearl. I'm 7 chapters in and on my way to the 2nd gym. Why exactly are you trying to lure people away from discussing Scratch? At least it has “forums” in the name on the link, now. It was confusing with it called “Discuss”, I initially thought it was just a place for parents to talk about how great the program is. Oops. This is 0% what their intention is. They are doing it to give more emphasis to the other buttons. Wanna check a brand new character?My meme army? Probably not…Or maybe have a spoof? DING DONG, YOUR OPINION IS WRONG! Projects in Show and Tell have never really gotten that much attention.